Tracklisting: 1. Fire Of Unknown Origin (4:11) 2. Burnin’ For You (4:30) 3. Veteran Of The Psychic Wars (4:50) 4. Sole Survivor (4:04) 5. Heavy Metal: The Black And Silver (3:19) 6. Vengeance (The Pact) (4:41) 7. After Dark (4:25) 8. Joan Crawford (4:54) 9. Don’t Turn Your Back (4:02) Lineup: Eric Bloom – lead vocals, bass (5) Donald “Buck Dharma” Roeser – lead guitar, vocals, bass (8) Joseph Bouchard – bass, vocals Allen Lanier- keyboards Albert Bouchard – drums, synthesizer, vocals Though it may not be the peak of originality, I would like to inaugurate my blog by posting a review of the album from which it takes its name. Released almost 30 years ago, the wonderfully-titled Fire of Unknown Origin counts as a firm favourite of mine – strange as it may sound to those who may not find it anything special, or even think it borders too much on AOR territory for comfort. However, it also contains a few songs that I would not hesitate to call masterpieces, as well as superb artwork, and a genuinely progressive vibe (though you should not expect anything resembling Yes or Genesis, of course). 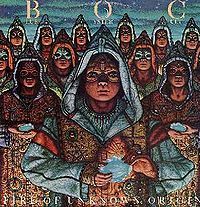 Fire of Unknown Origin features a major hit in “Burnin’ for You”, written and interpreted by criminally underrated guitarist Donald “Buck Dharma” Roeser – a catchy little number that got the band a lot of airplay at the time of the album’s release. Though a more straightforward (and also more openly commercial) composition than the legendary “Don’t Fear the Reaper”, it is still AOR with a bite, unlike some of the band’s later output. The other songs, however, are a different story – starting with the title-track, its typically cryptic lyrics penned by punk muse Patti Smith (who was in a long-term relationship with keyboardist Allen Lanier). A fine showcase for Lanier’s skills, it straddles the line between sophistication and commercial potential. The album’s standout track, however, is the magnificent “Veteran of the Psychic Wars”, written by vocalist Eric Bloom together with English fantasy writer Michael Moorcock (also known for his collaboration with Hawkwind), who in the previous couple of years had provided lyrics for two other BOC songs, “Black Blade” and “The Great Sun Jester”. As good as those two tracks are, “Veteran” is in a different league – definitely one of the band’s classics, and one of those songs that, right from day one, have held a constant appeal for me, especially in some difficult moments of my life: “My energy is spent at last/And my armour is destroyed/And I’ve used up all my weapons/And I’m helpless and bereaved….” A slowly but powerfully surging composition, it features a killer guitar solo by Roeser, and a haunting drum pattern that was probably inspired by Peter Gabriel’s equally riveting “Intruder”. Like most of the album, the song was originally written for the soundtrack of the animated film Heavy Metal, but was the only one to eventually feature in its final version. While “Sole Survivor”, featuring former Meat Loaf vocalist Karla DeVito, and the upbeat but somewhat weak “After Dark” follow the AOR-inclined path of “Burning for You”, the eerie, ominous “Vengeance (The Pact)”, and the dramatic “Joan Crawford” present the listener with frequent time changes, lush musical textures and intense, forceful vocals. The album closes with the soothing vocal harmonies, layered bass and keyboard lines of the deceptively catchy “Don’t Turn Your Back”, whose lyrics (not surprisingly for the band) deal with the subject of death. Like its predecessor, the excellent Cultosaurus Erectus, Fire of Unknown Origin was produced by hard-rock icon Martin Birch, who in those years would also revive Black Sabbath’s flagging career – and then proceed to make stars out of Iron Maiden. With great clarity of sound, sterling performances from all the band members, powerfully emotional vocals, and intriguing lyrics, it ranks undoubtedly as one of BOC’s best offerings. Though not as strongly cohesive as their third release, the stunning Secret Treaties, it is nevertheless highly recommended to all fans of vintage classic rock with a progressive bent. Hello Raff! Great blog you have going on here! Good luck with your new outlet for music writing! Great review, fantastic Cult album. This and ‘Cultosaurus’ represent the band’s peak period, IMO — B&W-era purists be damned! Thank you for the comment, and thank you for subscribing to my blog! Hope you will like it here!